The goal of Africa Talks is always to put the audience first. To help meet that goal, I’m excited to announce the launch of a brand new version of the site. The concept of Africa Talks evolved over time. The idea originated when I recognized the need to fill an information gap due to lack of interest or access to news about the continent and its global diaspora. I encountered people who tended to have a genuine interest in Africa, but whose knowledge was limited to the most horrific wars, famines or genocides. I saw a need to tell different stories and include unheard voices. Africa Talks started while I was living in Columbia, Missouri and volunteering at KOPN, a community radio station, and at CAT, a public access television station. I was able to conduct some interesting interviews and hold roundtable discussions about African issues, and I wanted to post them online to share with a wider audience. Later, I began hosting Global Journalist, a radio program aired on an NPR affiliate and sponsored by the University of Missouri School of Journalism. As I posted more stories and interviews, the positive feedback I received encouraged me to expand the site further. I realized the work I produced for traditional outlets (radio, print, television) needed to be digitized and archived in one place. Africa Talks was born as a result. For the last year, I have been pursuing a master’s degree in Journalism and Media Studies at the University of South Florida St. Petersburg. 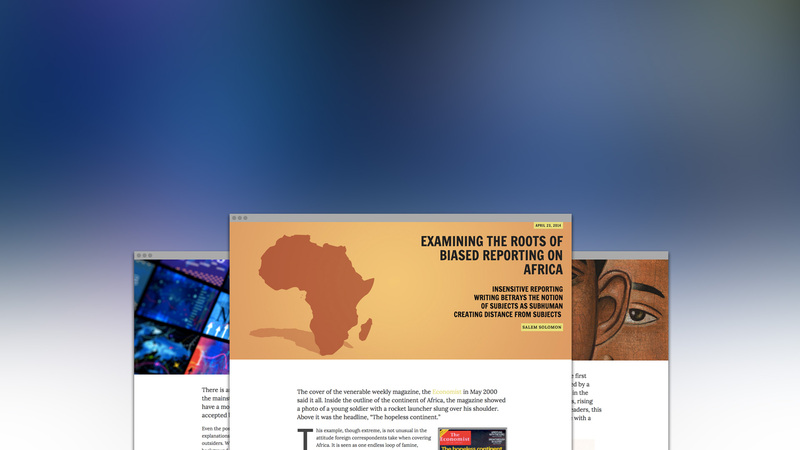 In the fall, I began an independent study project to update Africa Talks with the goal of making it more user-friendly, easier to navigate on various devices and more modern looking. The other goal was to expand and increase the amount of content that is uploaded to the site. I want Africa Talks to be the place readers turn to for in-depth, expert analysis on some of the most important and under-reported topics affecting the continent. 2014 was a busy year for me and for the website. 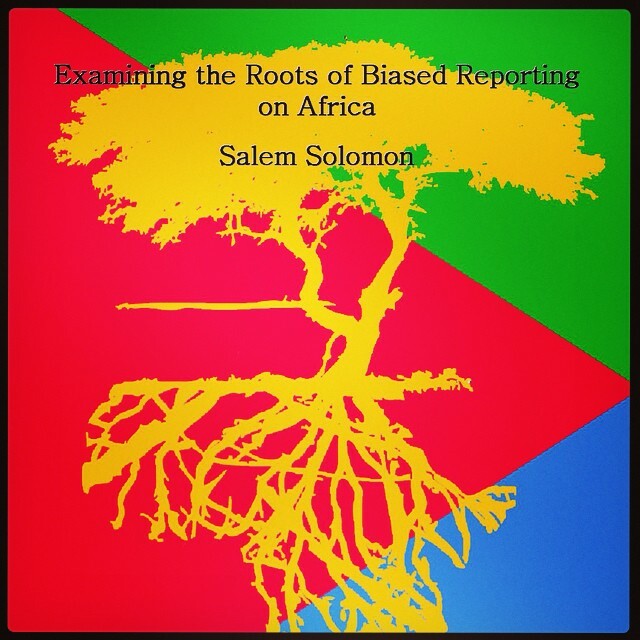 In April, I wrote a final paper titled “Examining the Roots of Biased Reporting on Africa” for Dr. Tony Silvia’s “Race, Gender and Class in the Media” class. This article shows how I plan to include multimedia in future posts. Take a look. In the months leading up to October, I was heavily involved in the planning process to host a group of visiting African journalists at USFSP through the Edward R. Murrow Journalism Program. I also helped design and build a stand-alone website documenting all activities associated with the visit of the fellows to the university. As part of the website, we compiled information about the state of the media in 13 African countries. I plan to migrate this data to the “African Media” section on Africa Talks. Eventually, it will be updated with information for every country on the continent. The section is a snapshot of individual countries including population size, languages spoken and mediums of communication. Here is a quick look at what the section looks like. I recognize the importance of publishing articles in respected news outlets to showcase what Africa Talks has to offer. Following the cancellation of the Murrow program at USFSP, I published op-eds in the Tampa Bay Times and the Crow’s Nest expressing my opinions about this misguided cancellation. 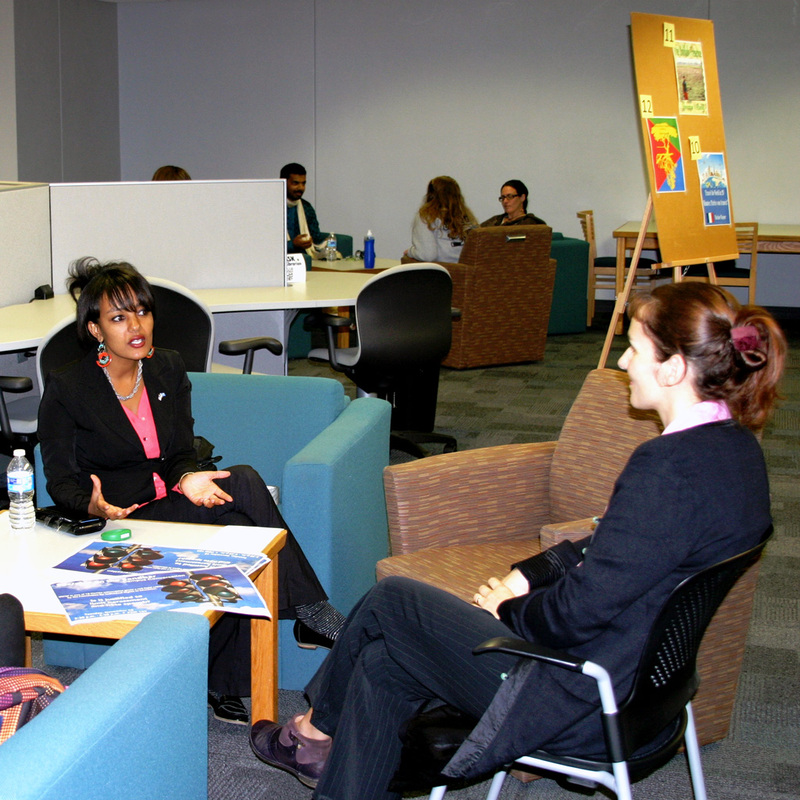 In November, I was invited to take part in a Multicultural Day at the Nelson Poynter Memorial Library where I met people genuinely interested in learning more about Africa. We discussed misconceptions about the continent and its people, including its diaspora. I was part of a panel discussion at the University of South Florida in Tampa on Nov. 25 about the communal and global implications of the Ebola outbreak in West Africa. The panel included Dr. Jamie Morano, Assistant Professor, Infectious Disease and International Medicine at University of South Florida; Dr. Earl Conteh-Morgan, University of South Florida Department of Government and International Affairs; Dr. Thomas Unnasch, University of South Florida College of Public Health. Here is a summary of my contribution during the event. 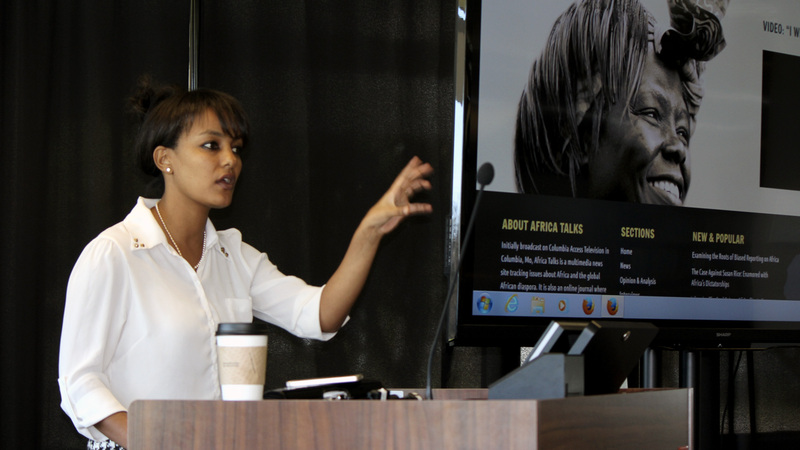 On Dec. 9, I was invited to present the evolution of Africa Talks at the Poynter Library at USFSP. There, I described how the site has moved from WordPress.com version to its current WordPress.org version. The idea for the new look of the site began to take shape after I took a class last May called Building Effective Websites, under the guidance of Dr. Casey Frechette. I can now comfortably say that I can use HTML and CSS. I also learned how to use web publishing tools and apply web design principles. The independent research project this past semester enabled me to apply the lessons I learned during the training to Africa Talks. But aside from what happens behind the curtains, designing and branding the site is integral to its future success. Below are some logos I toyed with before deciding to use the one that appears on the site today. and finally emerged in its current stage. I used Sublime to edit code, and I tested changes with Chrome’s Developer Tools. I formalized how I make changes to the site by creating a test version on my computer with MAMP. MAMP includes popular web and database technologies and makes it possible to run a local web server — perfect for testing and developing new site features. With SourceTree, Bitbucket and Dploy.io, I put Africa Talks under version control. This creates a detailed history of site changes and makes it easier to collaborate with others on various site changes. The project now lives in a new WordPress version. The current theme is developed using Bootstrap, an HTML, CSS and JS building tool to produce responsive, mobile first sites on the Web. 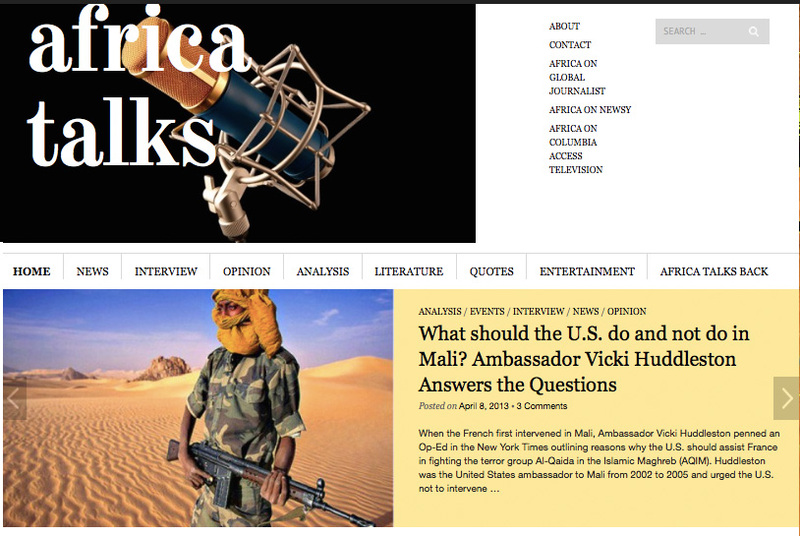 More specifically, Africa Talks used the 320press WordPress Bootstrap Theme. The theme is an HTML5 mobile-friendly and responsive theme for WordPress. It includes the homepage template, landing pages for single articles and other features including customized sidebars. A child theme was created, a theme that takes over the functionality and styling of another theme or the parent theme (320press WordPress Bootstrap). To the new and modified version of the new site. Single article pages had to be up to par with the present version and that meant updating posts with multimedia components. This will be an ongoing process. There is a new page highlighting important and inspirational quotes from African thought leaders. The site will continue to evolve. Over the last year I learned that if you have an idea and a purpose you can apply these tools to reach a global audience and publish content on par with prominent news organizations. I learned that there are many additional possibilities and the potential exists to expand the site’s mission through workshops and presentations. I also realized that there are close ties between journalism and education. 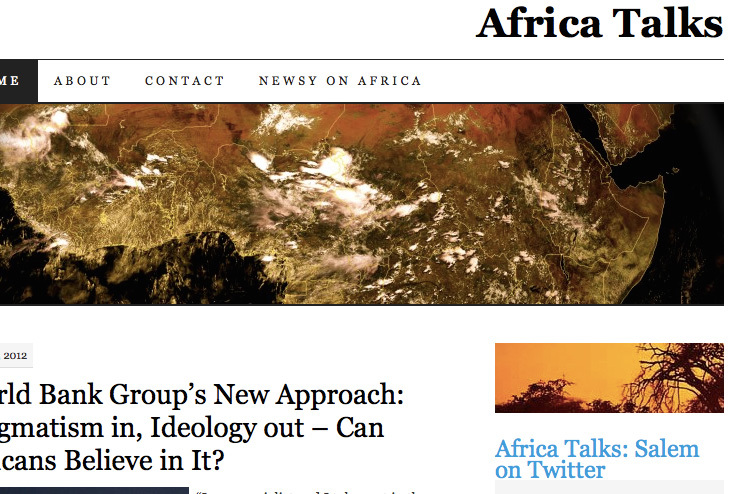 The new Africa Talks homepage. The training and workshop section of the site will evolve as I plan to build partnerships with media outlets and organizations who share similar goals. The “African Media” section will continue to grow and more countries will be added using open source data. Finally, this spring, I have been accepted to The Washington Center, a semester-long internship and academic program. I will be based in Washington D.C., and I plan to build a network of people who can contribute to the site. There will be more focus on contributions to keep content coming to the site on a regular basis. Eventually, I plan to use this project as a launching pad to complete an applied research project (ARP) which is needed to complete my master’s degree. I would like to express my gratitude to Dr. Casey Frechette who has taken me under his wing and mentored me throughout this process. I will forever be grateful for his patience and guidance. This project would not have been possible without his generous help and deep knowledge.